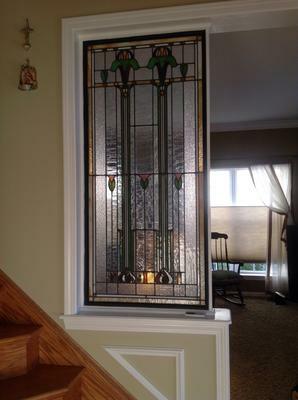 I'm looking for information about this window. It came into my possession around 2000. I purchased it from a designer friend in Indianapolis. He accepted in exchange for services rendered to a client. The client had kept it in their attic for two decades. The story that they relayed to him was that their son had taken it from the site of a "famous" home near the Northwestern campus. The house was being torn down and this was one of a number of identical windows that had been removed from a sunroom/porch. When he graduated and brought this home the parents were so upset with their son for committing this theft, that they hid it in their attic all those years. I presume that if all this is true the windows were being removed for salvage and may have been reused in a single project or sold individually. I've always wondered about it's history. If anyone has a clue, I would welcome a response. I'd rather it have been found honestly, but your hands are clean. You are using it to very nice affect. It would be great if you had the whole collection, but with just one you found a great use for it. I don't know much about stained glass windows, other than that they had a resurgence with the Arts and Crafts movement. They were used a lot with Craftsman and Art Nouveau homes. They were still going strong with Art Deco, but fell victim to the Modernists. Unless this is a reproduction window it probably dates from the first couple of decades of the 1900's, or possibly a bit earlier. You can see the classical roots in the design. The use of the column as a pediment for a large flower. The repetition of the smaller flower on a tall erect stem is common. Sometime it is papyrus, or wheat, or a flower of some kind. I can't see the flower well enough to make it out, but maybe it is a lotus. I hope one of our readers can fill in some more details for us.